One of the first things I did when I started archival research back in the mid 1990s was look at the annual reports sent to the Ministry of Internal Affairs by provincial governors in the 1830s and 1840s. I was reading them looking for anything about food, but I remember being struck by the fact that they always included reports on local fire preparedness. I apparently didn’t take any notes about them, but I distinctly remember things like a report of the fire department of some district town being armed with two buckets and an axe, or something incredibly modest like that. It made me think about fire and its possible destructive role in a new way. In fact, at one point I thought I might do a whole research project on fire, and then Cathy Frierson’s All Russia Is Burning! came out. So that was out (even if the pre-reform period could still use some (any) work). But fire appears in so many different places in the eighteenth and nineteenth century that it’s hard not to notice it. Ivanovo: on January 21 there was a fire in the home of the peasant Andrei Klimov caused by a spark that flew out of the iron stove; 25 pieces of calico and clothing were destroyed by it; and due to this accident the 30-year-old daughter of peasant Klimov suffocated from the smoke. What a shock! A spark, a fire. From an iron stove, not a Russian one. (Was this a stealth warning against innovation in heating apparatuses?) Then, in the account, property damage of some considerable value. And only then the death of a nameless woman. What is one to make of that ordering of the story? It could be that my instincts have been warped by contemporary news programs that always put death first, and I shouldn’t expect the death of a peasant woman (and in Ivanovo at that time, a serf woman) to come first. Or was the life of the woman truly valued less than the cloth? 3. If due to my carelessness or that of one of my servants there is, God forbid, a fire, I Iumatov am obligated to repair any damage at my expense, or to pay the estate administration for the costs of damage as valued by the good peasants of the Ivanovo estate with the mediation of the estate administration if we can’t come to an agreement between us. 4. If a fire happens by act of God from a lightning strike, or if I Iumatov suffer damage from a fire that happens in neighboring houses, then no losses for that will be collected from me. On some level this isn’t really surprising at all—if Iumatov was guilty of causing a fire, he had to pay; if he suffered due to circumstances out of his control, he was not liable. Somehow, though, reading through this I was particularly struck by the aside—God forbid (Bozhe sokhrani)—in the middle of point 3. The mere mention of fire needs to be countered with a hope that no such ill befall the village. Cases like that of the peasant Klimov make that understandable on an individual level—save us from fire, save us from burning, save us from death. That immediate response is even more understandable if you look at the longer history of fires in Ivanovo. Published accounts of the village often list the many fires that caused serious damage in the village. One account listed a fire in 1775 in which 400 buildings were destroyed, including the trading rows, “many stalls with their wares,” two taverns, and two churches; another in 1781 in which 260 buildings were destroyed; and yet another in 1793 in which a further 500 buildings were destroyed. According to contemporaries, though, the biggest trauma to hit the village happened in 1839. On May 13 a massive fire destroyed 416 buildings and 61 factories. The village had grown hugely in the first decades of the nineteenth century in both population (at least part-time) and industry, and the fact that there were 61 factories to burn highlights that fact. As a result, the damages were staggering—according to one account property worth 1,100,000 silver rubles was lost. According to another, its value was more than two million rubles. 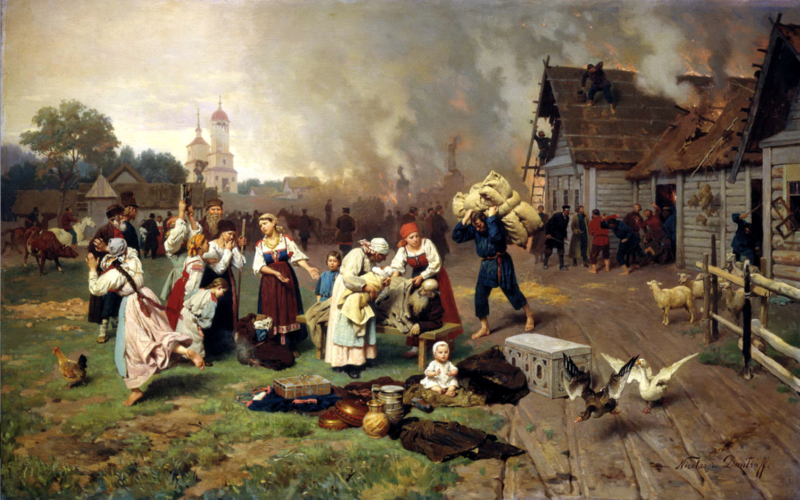 Those hardest hit were the industrialists of Ivanovo, mostly themselves freed serfs who had become merchants and factory owners, most of them living in or near the village under agreements with the estate administration and Count Sheremetev. They viewed the fire as a disaster, but also used it as an opportunity to try to alter the basis of their agreements with Sheremetev: Sheremetev owned all the land, they owned the buildings on it. To them, this was a chance to get something new. But that will be next time, in what is turning out to be a miniseries within the miniseries.